Talk about a bad move! A knife-wielding Florida man who attempted a carjacking Thursday night quickly discovered that the vehicle he targeted was an undercover cop car occupied by a pair of armed plainclothes detectives, according to an arrest affidavit. 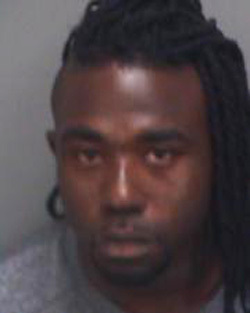 Dominique Albert, 27, allegedly approached the car on a St. Petersburg street around 9:45 PM and yanked open the passenger door. Albert, pictured at right, leaned into the auto while holding a steak knife in his right hand. While Albert’s would-be victims were initially startled by the interloper, they quickly rallied. A search of Albert turned up two other “large, fixed blade knives,” police reported. Some folks are just safer in Prison. Posted by btx3 on August 4, 2015 in Nawwwwww! Yogi-X, filmed here on a carjacking spree, already has the CD Player and Nav Unit stripped, on the dash and ready to go, as he works on the "fine Corinthian leather". 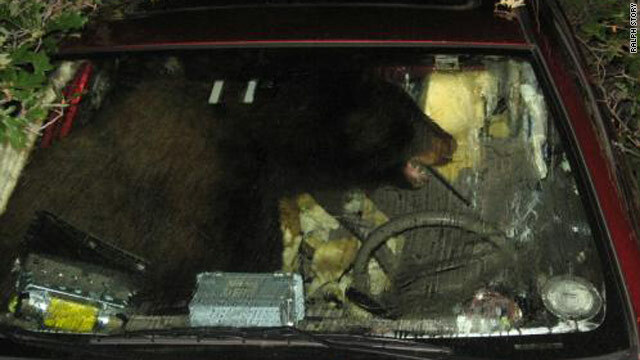 If you think you’ve heard it all, follow this tale of a hungry black bear who went for a ride, literally. Douglas County (Colorado) Sheriff’s deputies early Friday got a call about a honking car and a commotion inside. Perhaps it was teenagers or a thief, they thought as they approached Ralph Story’s 2008 Toyota Corolla. The deputies’ first clue to something unusual was that the car was 125 feet below its normal parking spot in the driveway of the Storys’ Larkspur home, which sits on five acres. The deputies had earlier received a call from a neighbor. She had heard honking and came up to the Story home, where the family was asleep. She noticed the car was rocking back and both and she called deputies shortly after 3 a.m., according to spokeswoman Michelle Rademacher of the Sheriff’s Department in the community 45 miles south of Denver. Story said the bear was probably drawn to a peanut butter sandwich left inside by his 17-year-old son Ben. He said the family didn’t realize what was going on until deputies arrived and the neighbor came back and called them. By then the car was no longer in the driveway. Incredulous, Story, his wife and three teen children — who have lived in Larkspur for 17 years — rushed outside to see the red Toyota down the hill and near a tree. Somehow, the bear had either opened the unlocked back door or pushed a window down to get inside. Understandably agitated, it bumped into the horn repeatedly and eventually knocked the car’s gear into neutral. The Toyota rolled down the hill. The door added to the bear’s indignity by closing at some point during the ordeal. A sergeant and two deputies who arrived on the scene “were stymied on how to proceed,” Story said. They considered a tranquilizer or shooting the bear, whose gender is unknown. “Public safety is our primary concern,” Rademacher said. It left a foul-smelling “present” on the front seat. Posted by btx3 on July 24, 2010 in Nawwwwww!